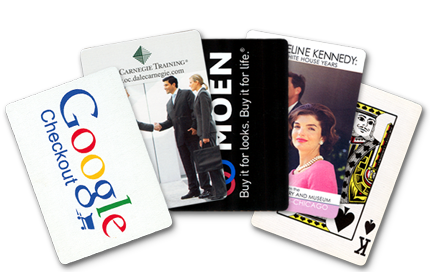 Custom Playing Cards for Businesses, Clubs, & Organizations! Anniversaries, Bar/Bat Mitzvahs, Birthdays, Celebrations, Magicians, Reunions, Weddings, and more! Try out our Deluxe Packaging options for your next custom order! in a Branded Bicycle Box. Low 25 deck minimum for 1-2 color backs! Custom-imprinted playing cards from Kardwell International are made in the U.S.A. on the finest quality stock. Your custom playing cards are printed with any design and copy you choose. To order, to get free samples, or to obtain information on custom playing cards, please contact us at 1-800-233-0828. Your satisfaction is guaranteed when you order custom playing cards from us. Your design and copy will be printed on the back of each custom playing card (custom faces are also available). We offer two custom playing card options, so you can choose the playing card that best meets your needs: (1) custom litho with 200-300 minimum quantity, or (2) custom imprinted playing cards with 25 deck minimum. 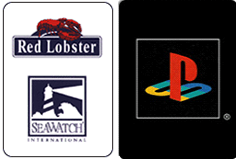 These are the same playing cards used by leading casinos such as Caesar's Palace and Trump's Taj Mahal. They are made in the U.S.A and are among the world's finest. The minimum order for 1- or 2-color custom playing cards is 200 decks. The minimum order for 3- or 4-color (full-color) custom-printed playing cards is 300 decks. 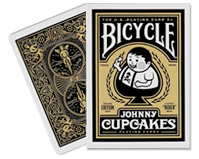 These custom playing cards are printed in the U.S.A. on top quality stock. The minimum order for one- and two-color logo playing cards or special design playing cards is 25 decks. Each Casino Quality or Imprinted deck is individually packaged in a die-cut tuck box with a cellophane window to show your custom back. 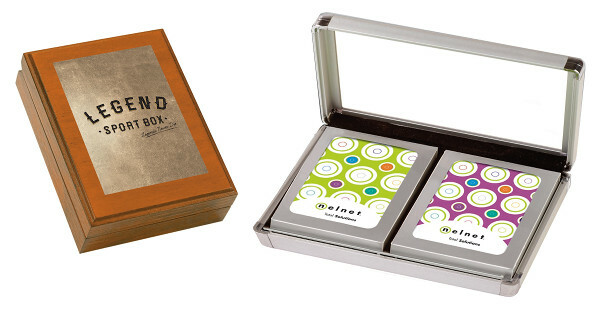 Your logo playing cards can also be packaged in suede or plastic boxes. Custom printed playing card production time varies between three to six weeks depending on the type of cards and options required. Rush orders are available for all custom playing cards. You can order custom playing cards with the design and copy of your choice. Pick from 16 card colors and 23 imprint colors, including metallic gold and silver. We offer personalized wedding playing cards, birthday playing cards, bar mitzvah playing cards, anniversary playing cards, graduation playing cards, or custom playing cards for any occasion you choose. Our custom playing cards are printed in the U.S.A. on the finest quality stock. The minimum order for personalized playing cards is just 25 decks. Photo playing cards are also available. Your one-color to four-color photo will be printed on the finest quality, genuine playing card stock. These playing cards may be personalized with your name and/or message. The minimum order for photo cards is 10 decks. Once you order, you will receive a proof of your custom playing cards in about a week. After you approve your proof, your personalized playing cards will be completed in just three to four weeks. Rush delivery is available (five working days after receipt of playing card art) for all personalized playing cards. Each custom-printed playing card deck is individually packaged in a die-cut tuck box with a cellophane window to show your custom back. Your custom playing cards can also be packaged in suede or plastic boxes. To order, to get free samples, or to obtain pricing and other information on custom playing cards, please contact us at 1-800-233-0828.